Obviously, any analysis of the Smarty Jones must begin with Mr. Z, who is likely to be a heavy favorite. In his last two starts, Mr. Z was beaten a head when third in the Los Alamitos Futurity (gr. I) and beaten a nose when second in the Delta Downs Jackpot Stakes (gr. III)—talk about a pair of heartbreaking defeats! However, the fact that Mr. Z has nothing but a maiden win from eight starts could play in his favor on Monday, for he will run in the Smarty Jones carrying just 115 pounds; seven less than his stakes-winning rivals Bayerd and Private Prospect and four less than Lucky Player and Hebbronville. This sizeable weight break, coupled with his remarkable consistency and impressive Beyer speed figures, makes Mr. Z look like a standout on paper against his eight rivals. My lone concern is that Mr. Z did drift out quite a bit in the Los Alamitos Futurity, despite the best efforts by Mike Smith to keep him running straight. Perhaps it was a one-time incident, but coming at the end of a season in which Mr. Z never had more than a one-month break between races, it’s fair to question if the colt is starting to show signs that he is running out of steam. Keeping this in mind, I’m going to try and beat Mr. Z with Far Right. The son of Notional was soundly beaten in both the Nashua Stakes (gr. II) and Street Sense Stakes in October 2014, but stepped up with an eye-catching effort in his most recent race, the Delta Downs Jackpot Stakes. Sent off as a longshot at 23-1, Far Right was rallying strongly along the rail when forced to check on the far turn, stopping his momentum and causing him to lose three of four lengths of ground. In spite of this, Far Right managed to re-rally to finish third, four lengths behind Mr. Z. If not for the incident on the far turn, I have little doubt that Far Right would have finished much closer to Mr. Z, and he might have even won the race. In the Smarty Jones, Far Right should be able to work out a ground-saving trip from post one and will pick up the services of top jockey Mike Smith. Since the Jackpot, Far Right has turned in a quartet of half-mile workouts at Oaklawn Park, and with only 115 pounds on his back, he appears poised to turn in another career-best performance. If Mr. Z regresses at all off his juvenile form, Far Right should be able to pull off an upset at a solid price. Another logical contender is Bayerd, a front-running colt that managed to carry his speed for a mile in the $250,000 Remington Springboard Mile last time out. But as talented as he may be—he’s won two stakes and has never been out of the trifecta in five starts—I have the feeling that a mile will prove a bit far for him against top-class company, for in the Springboard Mile, he got an ideal setup sitting second behind a runaway leader, then just barely held off a late run from Shotgun Kowboy while running the final quarter-mile in :25.72 seconds. He will definitely be a pace factor, and could certainly finish in the exotics on class alone, but I will stand against him for the top spot. One horse I do like quite a bit is Hebbronville, who began his career with a trio of exceptional efforts at Parx and Belmont, including a narrow loss to the highly-regarded Blofeld in the Futurity Stakes (gr. II) (VIDEO), a race in which Hebbronville finished ahead of Far Right. Unfortunately, Hebbronville’s most recent start was a major disappointment, as he failed to fire at all while being eased in the one-mile Nashua Stakes (gr. II) at Aqueduct. It’s difficult to say for certain why Hebbronville ran so poorly—perhaps the muddy track had something to do with it—but he’s trained well in recent weeks,and I’m willing to forgive his Nashua performance and hope that Hebbronville rebounds with a much sharper effort on Monday. I would also like to take a moment to mention Private Prospect and Lucky Player, the 1-2 finishers in the Prairie Meadows Juvenile Mile Stakes last August. Private Prospect went on to be beaten just a head in the seven-furlong Arlington-Washington Futurity (gr. III) before running ninth in the Breeders’ Cup Juvenile (gr. I), while Lucky Player won the Iroquois Stakes (gr. III) over the talented Bold Conquest before finishing eighth in the Juvenile and seventh in the Kentucky Jockey Club Stakes (gr. II). Both colts are very capable and could be in the mix, but their recent efforts suggest that they might be a cut below the favorites, and their speed figures seem to concur. So to tie it all together, I’ll take Far Right as my top selection, with utmost respect to Mr. Z, who should win this race with ease if he runs as well as he has in his last three starts. I also like Hebbronville a lot in this race, particularly if he goes off at around 9-2 or higher, and I’m confident that those three have an excellent chance to sweep the trifecta. Who do you like in the Smarty Jones Stakes? 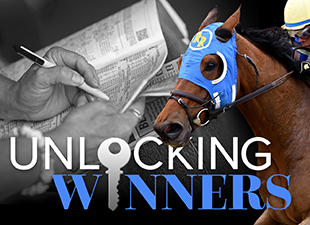 In order to aid in keeping track of all the prep races and results, I will be posting links to the Kentucky Derby prep race schedule and the Kentucky Derby point standings at the bottom of each Unlocking Winners blog post from now until the Derby. Enjoy the racing!